There is a new kind of swimsuit on the market! One takes out the hassle, tugging, hopping and strain out of putting on a traditional swimsuit. This patented design was co-designed by someone who has arthritis, who relied on swimming to manage her symptoms. It has the look and feel of a traditional swimsuit, yet it is made out of two, diagonal half suits that can accommodate for mobility limitations. As a 20 year veteran of teaching water aerobics, I like to keep current in all aspects the industry. For many years there haven't been any new developments in the swimwear category--until now. I discovered Step in 2 Now swimsuits in an aquatic professional journal, and immediately looked at their website. I love the concept and was glad that Yoga For Arthritis asked me to try it out. This suit is intended for someone with limited range-of-motion, and I had a rotator cuff injury which severely challenged my arm mobility. Pulling on a regular aqua fitness suit was torture; it took way too much time, and internal and external shoulder rotation was extremely painful. It certainly didn't encourage me to get in the pool 3 days a week to teach, exercise, or for my own aqua physical therapy. We know that water aerobics and other water-based activities are excellent no-impact fitness and even therapeutic options for people with joint pain, but if you can't get into the clothes, you can't benefit from participation! Step in 2 Now suits aim to address that challenge. The two pieces are easy to slide into, and it doesn't require any twisting or turning to get the shoulder straps up. My students originally called it the "Flintstone Suit", but ultimately stated that the design is genius. It's design is stylish; the princess seam is a pretty detail. The fabric is luxurious to the touch. I haven't worn it enough to see if the XtraLife Lycra will withstand chlorine longer than the usual polyester fitness suits I wear. The shoulder straps do not restrict movement at all, nor do they slip off with arm movement. No zippers, Velcro, or other uncomfortable notions to contend with. Bonus: It came with a free drying line. The v-cut of the surplice bodice is a little low. There are ties at the bust line to hold the two sides together, but I felt a little exposed. I'm used to more modest cut suits; however, my students say they think it is attractive. I didn't have any "spillage" when jumping! I was told they're tightening the elastic in the leg holes for 2015. This would be good, as I found myself tugging the rear end fabric after vigorous exercise. The side labels are really irritating! I had to cut them out! Maybe they could print the info on the fabric instead of sewing a label into the seam. Pricing. Half of my classes said they'd never pay $128.00 for a one-season suit. Many of them are in the pool 5-6 times a week and opt for clearance rack swimwear because chlorine eats away the fibers so quickly, even with proper care. It's a dilemma...we need sanitized water! I would recommend Step in 2 Now bathing suits to those who have movement limitations that make swimsuit wear a challenge, or who are tired of the "tug and pull" method of getting into a swim suit. Its unique, attractive design will encourage individuals to get into the pool, instead of having another excuse to avoid it. Click here to see a video of the Stepin2Now Suit. Click here to purchase a suit and take advantage of the exclusive, 25% YFA discount! Join in the celebrations as Yoga for Arthritis Founder, Dr. Moonaz helps to expand the reach and understanding of yoga in our society. Dr. Moonaz will be contributing her expertise in the field by co-authoring a chapter in the forthcoming textbook: "Principles and Practice of Yoga in Healthcare". This professional-level textbook will capture commentary from the leading researchers, scientists and therapists in the field of yoga therapy, and is expected to become a key resource in the field of yoga therapy. This textbook is largely devoted to a review of the published research on yoga therapy, and is an academic medically-oriented textbook primarily intended as a guide for clinical yoga therapy application for professionals including MD’s, healthcare providers, yoga therapists, and yoga instructors. Dr. Moonaz's contribution will help to establish a working definition of yoga and yoga therapy. Traditional components of yoga will be discussed in more depth, such as the postures/asanas, pranayama and meditation and how each is used in empirically-based interventions. In teasing out some of the finer details of these components, health-care professionals can expect to gain clarity and a deeper understanding on the elusiveness of “yoga” that is used in some research studies. Update Jan 2017. This book has been released and you can find a review and purchase information on our website HERE. Arthritis affects one in five adults in the U.S and is the nation’s #1 leading cause of disability, resulting in deterioration of joints, bones, muscles, cartilage and/or other connective tissues - creating challenges for everyday movement. The number of people suffering from arthritis is projected to soar within the next 20 years. People with arthritis who exercise regularly have less pain, more energy, and improved sleep. However, ironically, because of the pain associated with movement, arthritis is also one of the most common reasons for limiting physical activity. A regular yoga practice can increase muscle strength and endurance, and balance, and the emphasis on mindful movement can be particularly beneficial for arthritis sufferers. Are you looking for further research and information like this and even a SAMPLE CLASS demonstration? Look no further! Dr. Moonaz has partnered with YogaU Online to offer a 2-part course providing an in-depth understanding of what predisposes people for arthritis, and the role yoga might play in prevention and management of this painful condition. In this course, Dr. Moonaz discusses the research evidence for the effects of yoga on arthritis and how yoga practice can be modified for commonly affected joints, or changes in disease severity. To gain full access to this series - including two, one-hour sessions plus a yoga practice video, click HERE. Click HERE for a preview session on the benefits and current research on Yoga for Arthritis. Stress exacerbates arthritis pain. In conditions like rheumatoid arthritis (RA), stress can contribute to the frequency and severity of disease flares. And in the mechanical condition of osteoarthritis (OA), stress can make joint pain feel worse. In addition, chronic pain can be stressful, creating a challenging loop. And while the holiday season is a time of celebration and merriment, it can also be a very challenging time, filled with expectations and demands that take us out of our usual routine. Daily rituals that encourage us to slow down and be in the moment are a helpful antidote to the hectic swirl we might see around us. One of the ways that yoga helps to improve symptoms for people with arthritis is probably the act of being mindful- stopping the onslaught of over-thinking about the past and future to just be fully present in the activity of the moment. When I was a girl, my mother was the only tea drinker I knew. She carried her fancy tea bags in her purse, so she could ask for a cup of hot water when everyone else drank coffee. 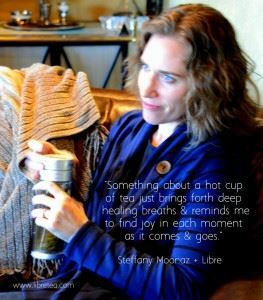 There is something about a cup of tea that is nurturing- that makes us slow down and be in the moment. It induces something called the Relaxation Response, which is the opposite of the stress response. It calms us down from the frenzy of life. Cultures around the world have rituals for tea that are long and elaborate to ensure mindfulness, much like a yoga practice. Using loose leaf tea makes me feel connected to those rituals, and it has a nurturing feel to it. There is a reason that a hot cup of tea is such a popular home remedy for a cold or flu. Lately, when someone asks if I’d like to meet them for a cup of coffee, I continue in my mother’s footsteps and let them know I’m more inclined to drink tea. Fortunately, thanks to Libre Tea's glass and BPA-polypropylene Travel Tea Mugs and Glasses, I can bring my own loose leaf with me, and refill with hot water on the go. Below is a link to their website, if you'd like to try a cup for yourself. If you use the code SteffanyLeading20% in the discount box you’ll even get 20% off your order. *Be sure to speak with your doctor, because some teas, like any other natural supplement, can interact with medication.